Margarete Heymann-Loebenstein Marks, ca. 1925. Photo courtesy Bauhaus Archiv, Berlin. Ever wonder about the details of developing an art museum exhibition? I have to admit, an advanced degree in art history does not directly prepare a curator for the loan agreements, budget constrictions, press relationships, and conservation concerns that must be negotiated and balanced along with telling a great story. In order to break down and share what I think is a pretty fascinating process, I’ve put together a six-part blog post series that addresses the steps I took in developing the Milwaukee Art Museum’s Grete Marks: When Modern Was Degenerate exhibition (on view September 6, 2012 – January 1, 2013). Every exhibition should start with and keep at its core great artwork and a meaningful story. For me, this exhibition germinated when I encountered a Bauhaus-trained ceramist named Grete Marks in 2007. I’d never heard her name. I wasn’t a Bauhaus expert. But I felt something for her teapots. I was working as an assistant curator at the Museum of Art, Rhode Island School of Design. Our team was putting together Subject to Change: Art and Design in the Twentieth Century, a survey that would showcase The RISD Museum’s collection and be instructive to students at the art and design school. We wanted to dedicate a section, therefore, to the German Bauhaus school (1919-1933) and its new scholastic approach to art education. The Bauhaus was the seat of the Modernist multidisciplinary movement to integrate handcraft, fine art, and the science of mass-production. Grete Marks (German, 1899–1990), Haël Werkstätten Factory (Marwitz, 1923–34). Footed Bowl, ca. 1930. Photography by Erik Gould, courtesy of the Museum of Art, Rhode Island School of Design, Providence. Using all the secretive curatorial research tools at my finger tips (read: Google), I quickly learned the outline of Grete’s story, convinced my colleagues that this artwork was perfect for RISD, and after many steps (similar to these blog posts detailing how a Museum goes about purchasing artwork at auction) was thrilled to shepherd Grete Marks into The RISD Museum’s permanent collection. The works went on view in the “Subject to Change” 20th-century art and design survey installation. One work, the footed bowl, is pictured at right. Together with RISD’s teapot, it will be traveling to Milwaukee to be part of our upcoming exhibition–reunited and it feels so good. For several years, I continued to add to my understanding of Grete’s training, artwork, entrepreneurial career and its political context. I compiled secondary literature, learned the whereabouts of her artwork in private and public collections, and discovered that there had never been an American exhibition dedicated to this designer. 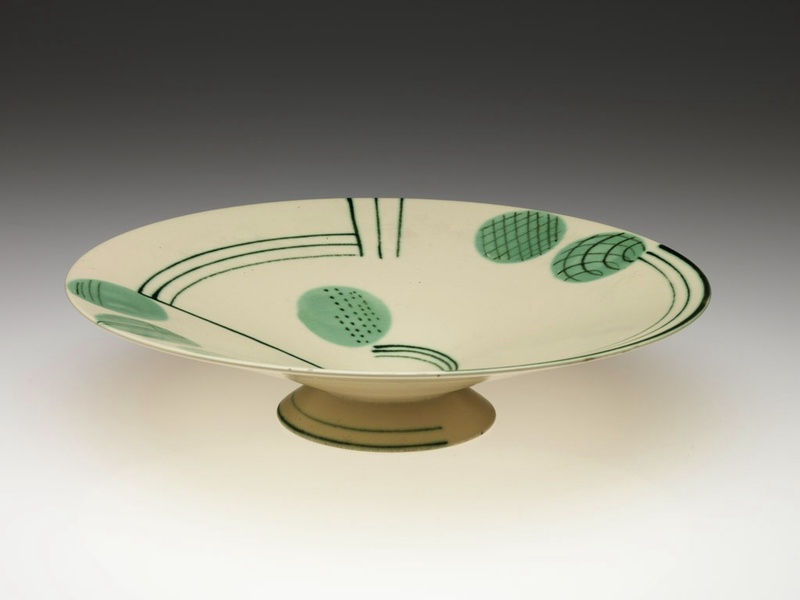 After moving to a new curatorial position at the Milwaukee Art Museum, I was helping to plan the annual symposium of the American Ceramics Circle in 2010 and took the opportunity to bring Grete’s story to that crowd. 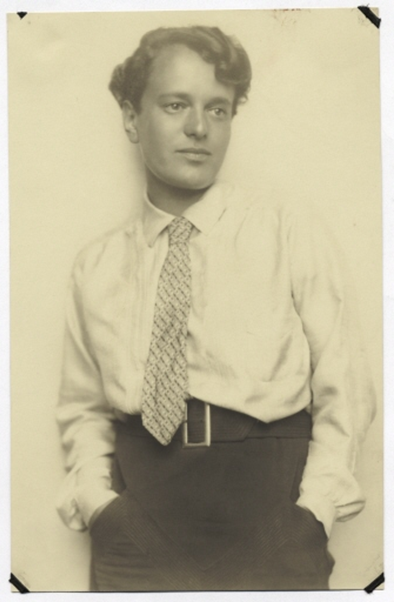 The story I presented was the tragic tale of a forward-looking Modern artist whose great designs were deemed “degenerate” by the Nazi government. That audience, too, loved Grete’s artwork and fascinating life journey. The presentation became the impetus for the exhibition at the Milwaukee Art Museum, through the process I’ll describe in coming posts. Grete Marks was born in 1899 to a bourgeois family in Cologne, Germany. 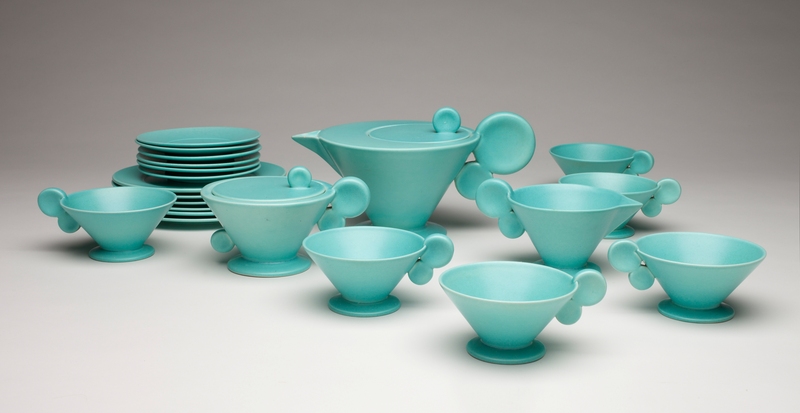 She attended the Bauhaus and, together with her husband, later founded the Haël Werkstätten für Kunstlerische Keramik (Haël Workshop for Artistic Ceramics) near Berlin in 1923. Grete and the Haël factory embodied the teachings she learned as a Bauhaus student from 1920 to 1921, under instructors like Johannes Itten and Paul Klee. Grete, an independent spirit, provided the creative leadership for the factory, which united modern design, quality handcraft, and industrial manufacture. Grete Marks (German, 1899–1990), Haël Werkstätten Factory (Marwitz, 1923–34). Tea Service, ca. 1930. Milwaukee Art Museum, Purchase, by exchange. Photo by John R. Glembin. In its ten years of production, Haël Workshop introduced a variety of tableware—including striking conical teapots (like the one above) and vases with expressionistic brushwork—to consumers across Europe and the United States. The promising young designer lived the Modern utopian idea that thoughtful art would improve society. Today, we would call the Haël Workshop ceramics modern, stunning, or sleek. But with Adolph Hitler’s rise to be Chancellor of Germany in 1933, Grete’s teapots were called “degenerate” and placed in a “chamber of horrors,” or schreckenskammer. In the new political environment, Marks was guilty of being artistically vanguard, politically left leaning, and Jewish. In 1934 a Nazi agent purchased the Haël Workshop at far below its appraised value. On May 20, 1935, the propaganda newspaper Der Angriff slandered Grete and the Haël Workshop, calling the designs “the product of a degenerate and misunderstood functionalism.” The picture in the newspaper, shown below, compares Grete’s ceramic artwork on the left to the works made at the factory under new (Aryan) leadership on the right. Although the Haël Workshop was a victim of Nazi Germany, Grete was not. She immigrated to England in 1936, but not without losing friends and family, including the death of her mother in the Nazi’s Sobibor extermination camp in German-occupied Poland. Using her reputation and business contacts, Grete began work in England’s Stoke-on-Trent potteries in 1937. In these traditional manufactories, she held a variety of design positions, including her own named line at Minton & Co., but she never regained the artistic excellence she had attained while running the Haël Workshop. 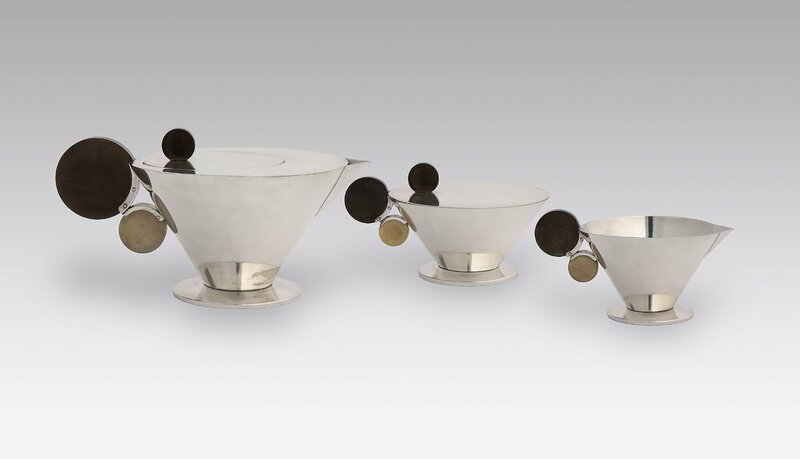 Ultimately, Grete Marks’ legacy is that of an accomplished designer who dedicated her life to the pursuit of useful and visually powerful artistic objects. Her remarkable talent unveiled itself fully in her designs at the Haël Workshop, where she realized the utopian Bauhaus vision of merging good handcraft and Modern design with new modes of large scale, efficient manufacture. In many ways, Grete Marks is a true Bauhaus success story. I am honored to share her history. Grete Marks (German, 1899–1990), Possibly Haël Werkstätten Factory (Marwitz, 1923–34). Tea Service, ca. 1930. The Nelson-Atkins Museum of Art, Kansas City, Missouri. Purchase: The Charlotte and Perry Faeth Fund. Photo: Jamison Miller. In this “Making an Exhibition” series, I’ll address the next steps in taking this story and making it into a museum exhibition. The background work involves conversations with private collectors, trips to London and Berlin, meetings with registrars and press managers and development officers, think tanks with exhibition designers, lectures for Museum staff, and emails, emails, emails. This entry was posted in Art, Behind the Scenes, Curatorial and tagged Behind the Scenes, Design, Exhibitions, Grete Marks. Bookmark the permalink. Even a art museum should know the truth. Sobibor extermination camp was a German camp. It wasn’t Poland’s Sobibor extermination camp. Please correct it to read Germany’s Sobibor extermination camp imposed on occupied Poland. Please do NOT call any of the death camps “Polish” OR “Nazi camps in Poland” OR “Poland’s Nazi camp”, OR “Nazi camp of Poland”. As the son of a member of the Polish underground whose unit “Zoska” was acknowledged by Yad Vashem for saving 350 Jews during the 1944 Warsaw Uprising, I would like to point out that referring to a German concentration camp in occupied Poland as just a Nazi camp “in Poland”, “of Poland,” or “Poland’s Nazi camp,” is insensitive to the families of the millions of ethnic Poles who were killed, forced into slave labor, tortured, maimed, terrorized and starved during the brutal and inhuman occupation of Poland by Germany in the name of “Deuthschland, Deutschland Uber Alles” and “Lebensraum” for Germans. There IS an extremely SIGNIFICANT, albeit subtle, difference between “in Poland” or “of Poland” and “in German occupied Poland”. “Poland” refers to territory in which Poles are in charge, while “German occupied Poland” refers to territory in which Germans are in charge through the use of force. Being that other European nations voluntarily allied themselves with Nazi Germany while Poland did not ally itself with Germany, in spite of repeated offers by Hitler for Poland to ally itself with Nazi Germany against the Soviet Union, and then paid a high price for this in blood, this is an important distinction. Thank you for the correction. Best wishes for the future.